New Paper Accepted for Publication - Opioid Attentional Bias and Cue-Elicited Craving Predict Future Risk of Prescription Opioid Misuse - Eric L. Garland, Ph.D.
Today I had a new paper accepted for publication in the prestigious addictions journal, Drug and Alcohol Dependence. This paper, coauthored with my colleague Matthew Howard, describes new findings from a randomized controlled trial of Mindfulness-Oriented Recovery Enhancement for chronic pain patients prescribed long-term opioid painkillers. The new findings demonstrate that the extent to which an individual finds his or her attention automatically captured by opioid-related images (e.g., the image of an opioid pill bottle) significantly predicts whether they will misuse opioids 20 WEEKS LATER after completing treatment. 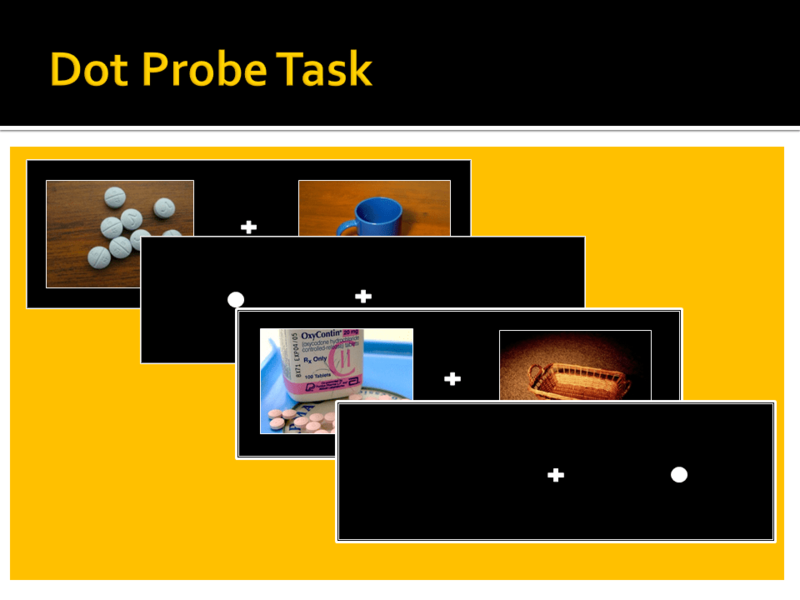 Before patients participated in the research treatments, they completed a dot probe task in which they were shown two pictures (displayed either for 200 ms, or 2000 ms), side by side, on a computer screen, and were asked to “choose the side with the dot” by clicking a button on a keypad. The computer recorded their reaction times down to the millisecond. We found that compared to people who did not misuse opioids at follow-up, people who ended up misusing opioids 3 months after completing treatment were significantly faster to choose the side with the dot when the dot replaced an opioid photo than when it replaced a neutral photo. This reaction time difference indicated that their attention was captivated by opioids. This effect was evident for cues presented for 200 ms (that’s one-fifth of a second! ), suggesting that this attentional bias occurred automatically, unconsciously, and before participants even had time to think about what they were doing. Even after statistically controlling for pain levels, opioid dependence, and pre-treatment opioid misuse, people with a stronger opioid attentional bias prior to entering treatment were significantly more likely to misuse opioids 20 weeks later than people with less attentional bias to opioids. So what is the significance of this research study for helping people with addiction and chronic pain? The study findings suggest that people who take opioids for chronic pain may develop an automatic tendency to be fixated on their medication, even when they don’t want to be. This tendency might make it difficult to stop thinking about opioids, causing craving, distraction, or other kinds of disruption in life. It might even result in or foretell opioid misuse down the line, long after a person has completed treatment. Using a performance-based dot probe test delivered by computer to detect risk for future opioid misuse may help physicians and health care providers make more informed decisions about whether and when to prescribe opioids to patients suffering from chronic pain. Great work Eric! what you call attentional bias I call attentional fixation. Whatever it’s called, it’s the same mechanism. I believe that all stress-related illnesses (depression, anxiety, eating disorders, addictions, PTSD, etc.) are derivative of the same process. The idea also maps onto Buddhist psychology perfectly well. Keep up the good work. I may have some news for you on Cascabel soon. Stay tuned.